Bottom is a role I already knew before enrolling in NUOVA this year, so the preparation is quite different than when you learn a role. I try to "unlearn" the music, so I don't sing it with the old habits, and then "relearn" it with the new technique I acquired in the past year. It is pretty fun to do this kind of work, as I know I can sing the role; I just have to improve the way I do! I had heard about Opera NUOVA a few times before this year, and it seemed like a really rewarding program. The really busy schedule was one of the factors that attracted me to the program. I'll have the chance to sing a role I have already sung, which for me is a real privilege. I'll have the opportunity to go deeper in the understanding of the character, and this gorgeous music, alongside a wonderful faculty. 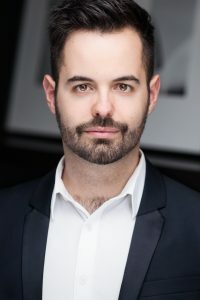 French-canadian baritone Dominic Veilleux has been praised for his rich and powerful voice, as well as his strong comic and dramatic skills. On stage, Mr. Veilleux has performed numerous roles including Leporello (Don Giovanni) and Agamemnon (La belle Hélène) on tour with Jeunesses Musicales Canada, Papageno (Die Zauberflöte) with Prague Summer Nights Festival, Figaro (Le nozze di Figaro) with Accademia europa dell’opera, D’Estillac (La veuve joyeuse), Erster Priester (Die Zauberflöte), Marco (Gianni Schicchi) and Fiorello (Il barbiere di Siviglia) with Opéra de Québec. In concert, he has been a featured soloist with many Quebec ensembles, such as Choeur Les Rhapsodes (Mozart’s Requiem, Bach’s Oster- and Himmelfahrtsoratorium, and Vivaldi’s Magnificat and Gloria), Ensemble Polyphonia (Duruflé and Fauré’s Requiem), Orchestre symphonique de Lévis (Beethoven’s Ninth Symphony) and Ensemble vocal A piacere (Dubois’s Sept dernières paroles du Christ). Dominic holds an Artist Diploma from the Music Conservatory of Quebec City, where he has studied with renowned mezzo-soprano Sonia Racine, and is currently studying at Université de Montréal, where he was recently seen as Don Alfonso (Cosi fan tutte) and Bottom (A Midsummer Night’s Dream). Highlights of the 2019-2020 season are Rossini’s Il barbiere di Siviglia as Bartolo with Opéra dans le Parc, as well as the creation of the new opera L’orangeraie with Chants Libres.